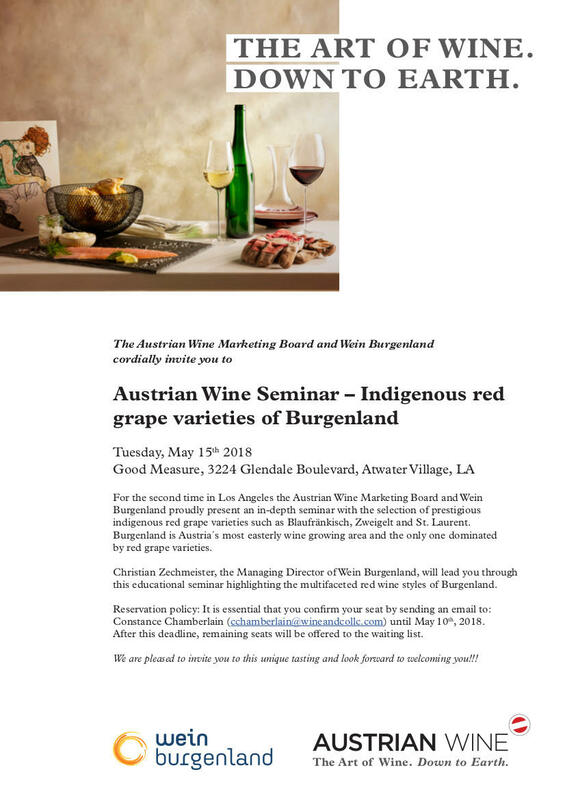 For the second time in Los Angeles the Austrian Wine Marketing Board and Wein Burgenland proudly present an in-depth seminar with the selection of prestigious indigenous red grape varieties such as Blaufränkisch, Zweigelt and St. Laurent. Burgenland is Austria ́s most easterly wine growing area and the only one dominated by red grape varieties. Reservation policy: It is essential that you confirm your seat by sending an email to: Constance Chamberlain (cchamberlain@wineandcollc.com) by May 10th. After this deadline, remaining seats will be given to the waiting list.